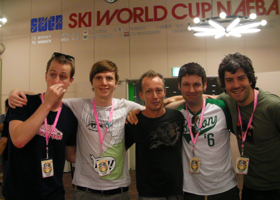 A pre-Summer Sonic ’09 conversation with UK electronic artist The Big Pink pondering life somewhere between Tokyo & London. Click on the play button below & get lost in translation..
A quick conversation with Royksopp who were very happy up here at Fuji Rock Festival ’09. 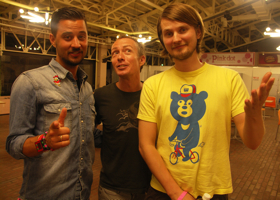 Click on the play button below for the happiness..
with Royksopp at FRF ’09. 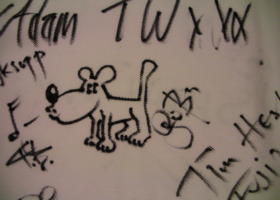 Royksopp dog & signed T-shirt at FRF ’09.. woof!! 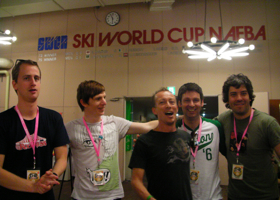 Jump on board for a supersonic blast with jetsetting Jet at Fuji Rock Festival ’09. Click on the play button below for take off..
With Jet at FRF ’09. A fun time with a totally inspiring lady at Fuji Rock Festival ’09. 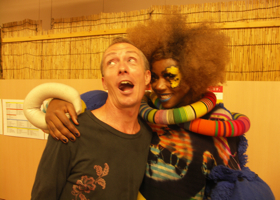 Click on the play button below for the spirit of London..
Ebony Bones at FRF ’09. 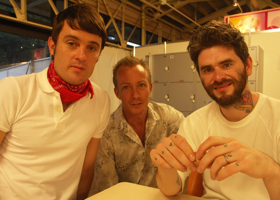 A chat at Fuji Rock Festival ’09 with some interesting rock boys from London who only occasionally tell White Lies. 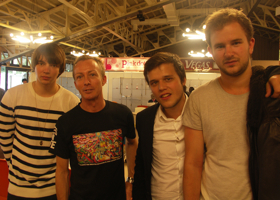 Click on the play button below for the truth..
With White Lies at FRF ’09. A wee dram & good laugh with The Japanese Popstars (in Japan!!) 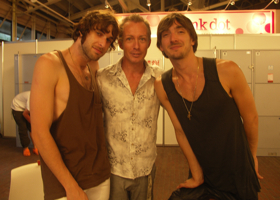 at Fuji Rock Festival ’09. Click on the play button below for J-pop stardom..
With The Japanese Popstars at Fuji Rock Festival ’09. I’m outta here Japanese Popstars!! Have a listen to Masao from Tokyo Made talk about it – click on the play button below..
Masao & Deanne from Tokyo Made. 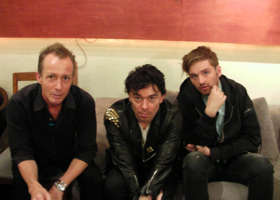 You are currently browsing the GUY PERRYMAN blog archives for September, 2009.